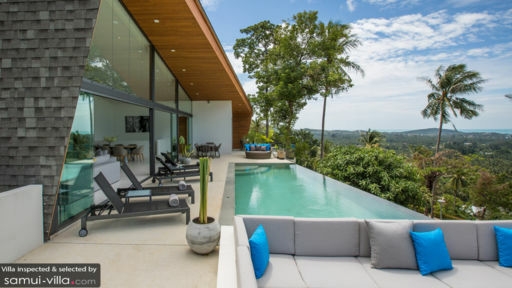 A stunning modern holiday home in Koh Samui’s Maenam hillside, Villa Azure Waters is a up and coming boutique villa with four bedrooms and modern spaces for rest, relaxation, and rejuvenation. A luxe, Scandinavian-style home, Villa Azure Waters features panoramic views across the coast of Koh Samui and Koh Phangan that can be relished from the infinity swimming pool. The villa features crisp and elegant interiors, modern comforts such as a games room, bar, and home theatre, as well as making sure to extend warm Thai hospitality to make your stay a memorable one. 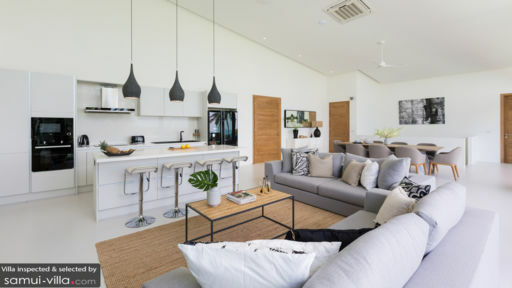 With four bedrooms, Villa Azure Waters in Samui is perfect for a vacation with family where everyone can enjoy their own space and comfort. The bedrooms have been furnished with king-sized and queen-sized beds whereas one of them even has twin beds. The minimal design is heightened with the presence of a glass wall and door that leads to a terrace. Spectacular and resplendent views await as you relax on the outdoor chair with a cup of tea. Aztec prints, light wood furniture, and monochrome colours make up the interiors. The bedrooms are air-conditioned and they have personal safes for your precious belongings. There are three bathrooms with elegant fittings and spacious modern showers including other amenities. Overlooking the most luscious view of tropical vegetation, hills, and the sea, is the infinity swimming pool making it the most striking feature of Villa Azure Waters. The various shades of blue merge with dense green to give you the best immersive experience. The pool deck is designed with sun loungers for basking under the tropical sun and there is even a sunken lounge right on the edge with sprawling views. On the other side of the you have a circular rattan chair and a smaller alfresco breakfast table for some delicious food amid fresh air and decadent views. 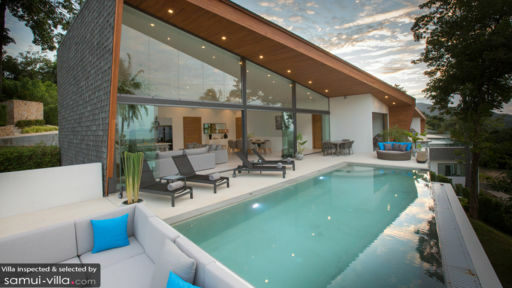 The architecture of the villa is cutting edge and modern with angular structures and a glass façade. Offering splendid views is the open-concept living room with entirely glass doors and walls on one side. The pristine whitewashed room is flush with abundant natural light and there are subtle colours in the room to accentuate the riot of colours outdoors. The sitting area is dominated by comfortable, grey-hued sofas while the modern kitchen stands right in front with a breakfast bar and state of the art fittings. The living area is centrally air-conditioned and even features an indoor dining table with seating for up to eight guests. All the while you’re enjoying the comfort of this relaxing space, the view encompassing various natural wonders is just a moment away. Villa Azure Waters prides itself in offering a well-equipped home theatre with recliner beds, a massive screen, and movie-viewing equipment. There is even a games room with a pool table and a bar with bar stools so you can grab some drinks in the evening. There are two on-site members of staff to look after all your needs and at the same time maintain your privacy. Housekeeping and maintenance is well looked after while guests also have access to the villa car without an extra cost. The villa chef is happy to take on requests for local and western cuisines as per your preference. Idyllic location in the heart of Maenam, Villa Azure Waters is nearby the historical Fisherman’s Village in Bophut; one of the few old-world villages where you can still experience an old way of living. The beach is not too far so you can traverse easily to enjoy the white sandy shores and cool azure waters.